The plug-in device, which closely resembles a tablet, comes equipped with a mirror, a built-in camera, and an opaque smart material triggered by propriety software. 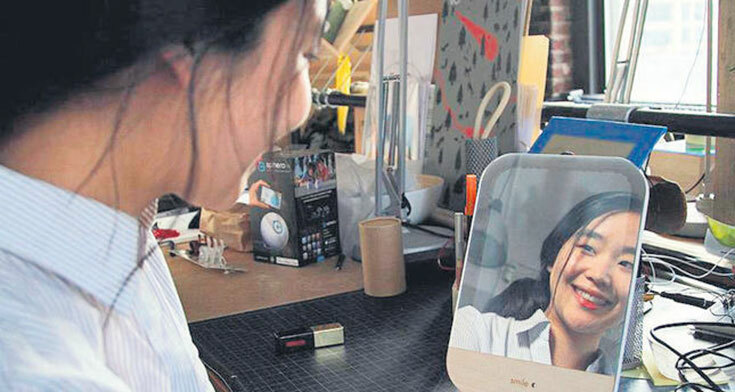 Facial recognition technology captures the face and prompts the surface of the mirror to change when a smile is detected. It can hang on a wall or sit on a table, much like a conventional mirror. Unlike a regular mirror, however, the price is currently standing at a staggering $2000-$3000 (USD). After witnessing a close family member struggle through cancer treatments, Turkish industrial designer Berk Ilhan decided to focus his work primarily on products that would cultivate joy and benefit cancer patients directly. The product will soon be launching a Kick-starter campaign in which Ilhan hopes to raise enough funds to bring the price down to $500 (USD). He also intends to donate the mirror to hospitals when it is financially feasible to do so.